One of the best ways to improve your chess game is by learning common patterns that show up time and again in games. By building this pattern recognition, you'll start to see more possibilities in your games, by recognizing simple patterns in more complicated positions. This article looks at basic checkmates — the kind every chess player has to recognize on the board in order to finish off a win. These basic checkmates will all be presented as mate-in-one problems; if you like, you can try to find the checkmate in each diagram first, and then read the explanation and answer below to see if you were right. Our first example uses a queen and rook together to deliver a checkmate. However, this same pattern can be accomplished with any two major pieces. The back rank checkmate may not look much like our first example, but the pattern is very similar. While we will still be using a major piece to deliver checkmate on the edge of the board, this time, the king's own pawns prevent him from escaping from our attack. The diagram above is a typical example of back rank mate. White's king is trapped behind his own pawns and is therefore stuck on the first rank. Black can deliver checkmate by playing Rc1++. Back rank mates are easy to see, but in most cases, they are also easy to prevent. In general, they occur only when a king has castled, there are too few defenders on the back rank, and the pawns in front of the castled king have not been moved. There are several ways to avoid being the victim of a back rank mate. Keeping sufficient defense on your back rank will prevent any enemy pieces from safely attacking your king. In addition, if you are worried about a back rank mate threat, you can always move one of the pawns to give your king an escape square. For instance, if it were White's move in the diagram above, playing h3 would prevent the checkmate, as the king could now move to h2 if Black played Rc1+ on the next move. The queen is a powerful attacking piece, but it usually needs some help to deliver checkmate. Many basic checkmates use the queen to deliver the checkmate, supported by a minor piece. The diagram above shows a queen and a knight working together to checkmate a king. White can finish the job by playing Qe7++. Although this example is simplified, it illustrates an important checkmate pattern that can be utilized with the queen along with a supporting piece. Against a king stuck along one of the board's edges, a queen — supported by another piece — placed directly in front of that king will always deliver checkmate, provided it cannot be captured by a piece other than the king. This pattern works because the queen takes away every square the king might flee to. For example, in the diagram above, a White queen on e7 attacks d8, e8, f8, d7, and f7, meaning the Black king has nowhere to run. There are no squares between the queen and the king, so there is no chance to block the check. The queen is supported by a knight, meaning the king cannot capture the queen. Black has no other pieces that can capture the queen either; with no way to avoid capture, Black's king is checkmated. The bishop can play a supporting role for a queen similar to that of the knight in the previous example. While the queen delivers the checkmate, the bishop can support the queen from afar. In the diagram above, White has a rook guarding the first rank, making a back rank mate impossible at the moment. However, both of Black's pieces are stationed on the long a8-h1 diagonal, which should give us a clue as to how we might attack the White king. Sure enough, the checkmating move is Qxg2++. The king is trapped, and cannot attack the queen because it is defended by the bishop. Minor pieces can deliver checkmates on their own, too. A pair of bishops can work together effectively; as each one can be dominant on squares of a single color, together they can dominate the entire board. A bishop and knight can also work together to secure a checkmate, though they may need a little more help to do it — either from their own pieces or from a few conveniently-placed defenders. The diagram above shows a bishop and knight working together to trap a castled king. White's own pieces block most of his king's potential escape squares, while the well-placed Black bishop takes away g2 and h1. As White's king has no way to escape, a check by Black's knight will certainly spell the end for White. Black finishes the game by playing Nh3++, checkmating the White king. Even the smallest members of a chess army can participate in checkmating an enemy king. In the right circumstances, pawns can be very dangerous attackers. The diagram above shows an endgame position where such a mate is possible. Black's king is doing its best to prevent White from promoting a pawn but finds itself trapped on d8 with nowhere to run. The simple c7++ ends the game, with the White king in support of his pawns being plenty to checkmate the Black king. 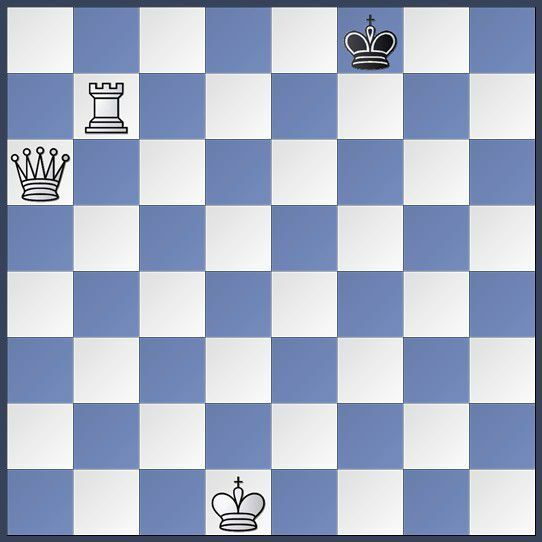 The "smothered mate" occurs in cases where a king is too well defended for its own good. The ingredients are simple; a king (usually in the corner of the board) which is completely entombed by his own pieces, is attacked by a knight which can jump over the defenders to threaten the king. Because the king has nowhere to run, the result is a checkmate. Typically, a smothered mate requires a sacrifice and a series of checks to force the opponent ​to ​trap his own king, but this example requires just one move to complete. In the diagram above, White's king is already stuck on h1, as his own pieces prevent him from moving anywhere. For Black, it's just a matter of moving the knight to the right square. In this case, the proper move is Nf2++, delivering a smothered mate. Anastasia's Mate is a checkmate delivered by rook and knight along one of the rook files (the a-file or the h-file). This checkmate was originally seen in the novel Anastasia und das Schachspiel (or Anastasia and the Game of Chess). While several beautiful combinations can lead to the finale, the mate is just one move away in the position above. White has just delivered a check with the knight, causing Black to play Kh7 in an attempt to escape. However, White can checkmate Black by playing Rh3++. The rook attacks the entire h-file, while White's knight prevents the Black king from escaping to g8 or g6. Morphy's Mate, named after American master Paul Morphy, uses a bishop and rook together to trap the enemy king. Often, this pattern occurs after sacrifices are used to open up the king's position, although it can also occur (or be threatened) without the sacrifice of material. In the diagrammed position, Black's king is stuck on h8, pinned down by White's rook and his own pawn on h7. White can force checkmate by playing Bf6++ when there is no way out for Black. These basic checkmates, along with dozens of similar positions, are second nature to tournament chess players. Solving these and other simple mate-in-one problems is a good way to train your brain to recognize these positions when they occur in real games. If you can get to the point where the answers come to you instantly, you can feel confident that you won't miss these opportunities in actual games.